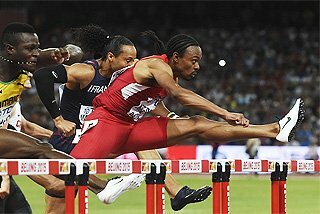 Brussels, BelgiumWith an unparalleled display of fluid rhythmic precision, Olympic champion Aries Merritt shattered the World record in the 110m Hurdles, clocking 12.80* to highlight the Memorial van Damme in Brussels, the final leg of the 2012 Samsung Diamond League series. Running before yet a capacity crowd of 47,000 at the King Baudouin Stadium, Merritt knocked a massive 0.07 seconds from the previous World record of 12.87 set by Dayron Robles in Ostrava in 2008. 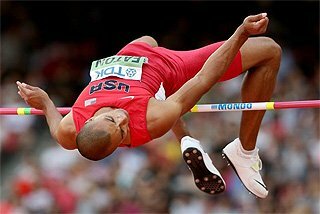 The last time a high hurdles World record was broken by that massive a margin was in 1981 when Renaldo Nehemiah clocked 12.93 in Zurich to lower his own mark by 0.07. After a slew of performances in the 12.90s this season, it seemed just a matter of time before Merritt would eclipse the mark. That this would be his night was clear before the race even reached the midway point. Fast from the gun, he had already pieced together a sizable lead by barrier three, extended over the next four and glided to the line where the clocked stopped at 12.81. Some moments later it would be adjusted to 12.80. "It was a shock when I saw the time pop up on the scoreboard," said Merritt, whose previous personal best of 12.92 equalled him as the sixth fastest man ever. "That was better than I ever could have expected. And later it was even corrected to 12.80. Unbelievable." Indeed. Olympic silver medallist Jason Richardson was a whopping 0.25 back in second, but with a very respectable 13.05. He in turn was well ahead of Jamaican Hansle Parchment (13.14) to recreate their London Olympic final placings. With his victory, Merritt also claimed the Diamond Trophy in the event with 18 points, his three series victories trumping Richardson’s two, who also finished with 18 points. The American was one of 15 athletes who ended the evening at least $40,000 richer and with a Diamond Trophy in hand. 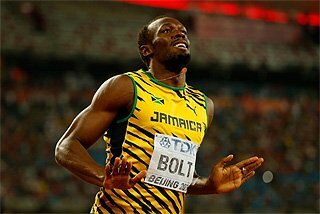 Another was Usain Bolt in the 100m, his first since the inception of the series in 2010. Another first for the Jamaican was being overshadowed at a meeting by another athlete. He was also among the first to pay his respect. "Aries deserves it," Bolt said. ".07 is a big improvement." There was no such improvement for the double Olympic sprint champion who didn’t seem to find his race until the 70-metre point when he finally left the field behind en route to a 9.86 victory. "I’m satisfied with the results because I could show something to the audience," said Bolt, who clocked a meet record 9.76 here last year. "The key issue was to finish the season injury free so that I can start well to prepare for next season." Nesta Carter was second in 9.96 to also finish second to Bolt in the Diamond Race, 18 to 8. Kemar Bailey Cole third in 9.97, a personal best. Kim Collins edged Nickel Ashmeade for fourth as both were credited with 10.03. Off the Samsung Diamond League programme, Yohan Blake returned to the track where he produced his 19.26 breakthrough a year ago. He wasn’t quite as fast but he was just as dominant. Clearly ahead just 30 metres into the race, he powered off the curve alone and went on to clock 19.54, a performance that only three other men have ever surpassed. "I could have done better this evening with stronger competitors," said Blake, who’s clocked 19.44 this year. "But as I said, I’m satisfied. This is a good time to finish the season." Jamaican Jason Young was second in 19.92 with Frenchman Christophe Lemaitre (20.17) third. There was plenty of celebration after the men’s 400m, a race where the crowd of 47,000 seemingly willed Kevin Borlee to victory. The Olympic finalist collected a decisive 44.75 victory ahead of his twin brother Jonathan (45.20) whose strong finish helped push Olympic silver medallist Luguelin Santos into fourth and out of the points. That resulted in a tie at 10 points between Kevin Borlee and Santos. Since each collected one victory on the Samsung Diamond League circuit, the Diamond Race victory went to the Belgian with his better performance in the final. Rounding out the sprints, European bronze medallist and Olympic finalist Myriam Soumare was a clear winner in the 200m clocking 22.63, 0.07 ahead of Jamaican Anneisha McLaughlin (22.70), with Charonda Williams just a bit further back in third clocking 22.74. But the American had no problem maintaining her series lead and taking the Diamond Trophy with 12 points. 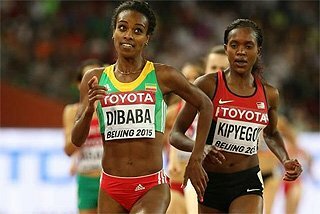 Moving to the longer distances, one of the most impressive performances came in the women’s 800m, where teenager Francine Niyonsaba took down an impressive field with strong and stubborn front-running. Behind the pacesetter, Niyonsaba carried a hefty through the bell (57.03) over both Pamela Jelimo and Olympic champion Mariya Savinova, and forged onward down the back stretch. Jelimo made serious headway into the lead down the backstretch but the Burundian was relentless. Every move for the lead Jelimo made was countered by Niyonsaba until she finally found herself running the final 50 metres alone to take a big 1:56.59 win, another national record. Jelimo was content with second in 1:57.24 to improve her series lead to 16 points and claim the Diamond Trophy. Olympic champion Mariya Savinova was a well-beaten third in 1:59.05, just ahead of Americans Brenda Martinez (1:59.14) and Anna Pierce (1:59.16), who clocked personal and season’s bests, respectively. The men’s 1500m was an entertaining affair with a strong Kenyan contingent seeking revenge for their medal-less performance in London. The winner there, Algerian Taoufik Makhloufi was running strong in the opening stages, running closest to the pacesetter through the 800-metre mark (1:52.25). Through three laps, Kenyan Nixon Chepseba had the lead, one he wouldn’t surrender to the Algerian as the pair entered the final turn, running nearly stride-for-stride. While Chepseba was busy fighting off and ultimately breaking Mahkloufi, Silas Kiplagat and Ethiopian Mekonnen Gebremehdin saved themselves for a battle over the final 50 metres where Kiplagat eventually prevailed in 3:31.98, 0.12 ahead of the Ethiopian. The victory also gave Kiplagat the Diamond Trophy with with 16 points, two ahead of Asbel Kiprop who, after missing two weeks of training, finished fifth here. Kenyan Bethwell Birgen (3:32.24) and Matt Centrowitz Jr (3:32.47) of the U.S. were third and fourth. Vivian Cheruiyot powered away from the field over the final 300 metres to win both the race on the track and the one for the Trophy. The Kenyan clocked 14:46.01, more than a second clear of Mercy Cherono (14:47.18) to tally 18 points in the Diamond Race, just two better than Cherono. This was the third straight Diamond Trophy victory for Cheruiyot, who raced to Olympic 5000m silver and 10,000m bronze in London. 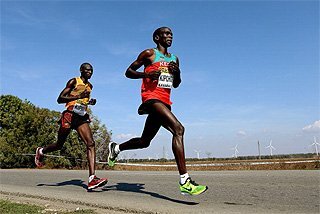 With Paul Kipsiele Koech starting the race with an insurmountable 11-point lead, there was no drama in the Diamond Trophy hunt, but there was a point to prove for Brimin Kipruto, the 2008 Olympic champion who fell in the Olympic final last month and finished a distant fifth. Here the 27-year-old ran confidently en route to an 8:03.11 victory, comfortably ahead of his 19-year-old namesake Conseslus Kipruto the reigning World youth and junior champion, who clocked 8:03.49. Koech, who also won the first two Diamond Races in the event, was third in 8:04.01. Koech said that this rare defeat doesn’t signal that he’s ready to hang up his spikes just yet. "I’m looking forward to winning it for the fourth time next year!" the 30-year-old said. 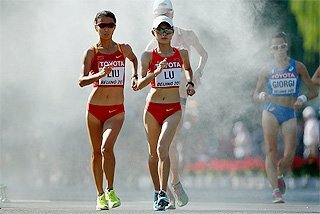 A late season 10,000m race is now a tradition in Brussels, and although it too is off the Samsung Diamond League programme and the anticipated assault on the World junior record never quite materialised, the race was the finest of the season, resulting in a world-leading run by Emmanuel Kipkemei Bett. 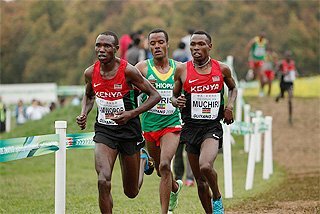 With four laps remaining, Bett, Vincent Kiprop Chepkok and Kenneth Kipkemon were well ahead with Ethiopian Yigrem Delamesh, the 18-year-old World junior champion, fighting admirably to hang on. With three to go he even bounded past the leading trio and into the leap. But his time at the front lasted exactly one lap. Chepkok, Bett and Kipkemon cruised by with 800 metres remaining and the order remained unchanged until the final 60 metres when Bett bolted by to reach the finish in 26:51.16. For Bett, who finished fourth at the Kenyan Olympic trials, this was his first victory over any distance this season. 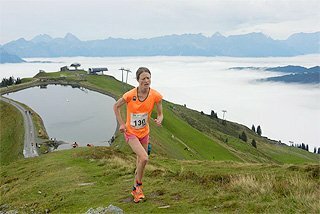 Chepkok (26:51.68) and Kipkemon 26:52.65 produced personal bests in second and third, as did Delamash, whose 26:57.56 was an improvement by more than 78 seconds. It was also the third best time ever by a junior. With a 9-point lead, Kaliese Spencer’s victory in the 400m Hurdles Diamond Race was a given, but she underscored her season-long form with a strong 53.69 victory here. 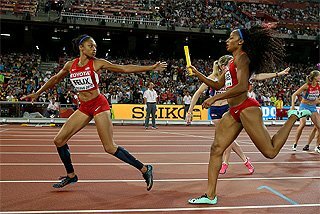 Running strong and well ahead through and off the final turn, the Jamaican stuttered slightly approaching the final hurdle, a miscue Perri Shakes-Drayton tried to take advantage off. The Briton came up short but still ran 53.89, not for from her 53.77 career best set earlier this year. Czech record holder Zuzana Hejnova, the Olympic bronze medallist, was third here too clocking 54.09. 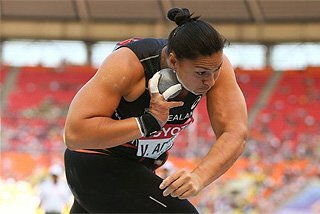 The first result on the infield came in the men’s Discus Throw, where Gerd Kanter, this year’s Olympic bronze medallist, claimed the first Diamond Trophy after winning with a 66.84m effort in the third round. Brussels was the third Samsung Diamond League victory for the 33-year-old Estonian who also took home victories in London and Lausanne and eventually tallied 19 points in the series. "For two years I was close but I didn’t have a good final," said Kanter, the 2008 Olympic champion. "But today I had my best performance in a 2012 Diamond League meeting." German Martin Wierig, another Olympic finalist, hit 66.05m in the final round to finish second, just ahead of Virgilijus Alekna, who reached 65.78m, also with his last throw. The 40-year-old Lithuanian, a two-time World and Olympic champion, who finished in the top five for the fifth successive Olympics last month, suggested prior to the meet that this would be his final competition, and reiterated his decision afterwards. "Yes, this is definitely my last season," he said. "My third place today is okay, certainly for an old man like me." Kanter was one of the first to pay his respects to one of the event’s all-time legends. "I have a lot of respect for Alekna," Kanter said. "He is a real gentleman and he is a real champion. 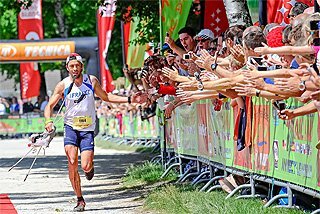 He won so much, twice Olympic champion and twice World champion. But I am happy I did not lose to him today!" Aleksandr Menkov rode his late season consistency all the way to the Diamond Trophy title in the Long Jump, and did so with the best leap of his life. Arriving after victories in Birmingham and Berlin, Menkov won here with an 8.29m leap in the fifth round, adding one centimetre to his previous personal best set last year. World junior champion Sergey Morgunov was second, reaching 8.04m also in the fifth round, just one centimetre better than South African Godfrey Mokoena. Menkov tallied 17 series points in all, ten better than Mokoena. One of the closest battles on the women’s programme was in the Pole Vault where in the end, just two points separated overall winner Silke Spiegelburg from World champion Fabiana Murer. The German record holder and 2012 world leader, who was fourth at the London Games, had a good night, jumping without a miss until 4.65m, which she negotiated with her second attempt. 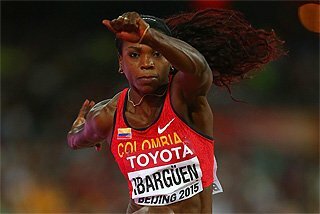 She missed twice at 4.70m, passed her last attempt in favour of 4.75m, which she cleared gracefully, then later bowed out with three tries at a would-be 4.83m world lead. Murer was second, topping out after second round success at 4.65m. Russian Anastasiya Savchenko and Cuban Yarisley Silva tied for third at 4.55m. There was an upset in the women’s High Jump courtesy of Olympic bronze medallist Svetlana Shkolina who was clearly the class of the field. The only jumper to scale 1.98m – Olympic champion Anna Chicherova passed at the height – she topped 2.00m with her first try to secure the unexpected win. Chicherova, who topped 2.05m here last year, went through 1.95m without a miss but failed three times at 2.00m to finish second. Olympic champion Olga Rypakova dominated the women’s Triple Jump, reaching 14.72m to take a decisive victory, and with it the Diamond Trophy with 24 points. Even her three of her other four fair jumps would have sufficed for the victory as runner-up in both the competition and the series, Olha Saladuha of Ukraine, reached a best of 14.10m. Slovenia’s Marija Sestak was a distant third with 14.10m. No others managed 14 metres. And finally, Olympic champion Barbora Spotakova added eight points to her already unassailable lead in the Javelin Throw with a 66.91m victory. The Czech also reached a solid 65.69 in the final round, farther than runner-up Sunnette Viljoen’s 65.33m best, also from the final round. Ukraine’s Vira Rebryk was third at 64.52.